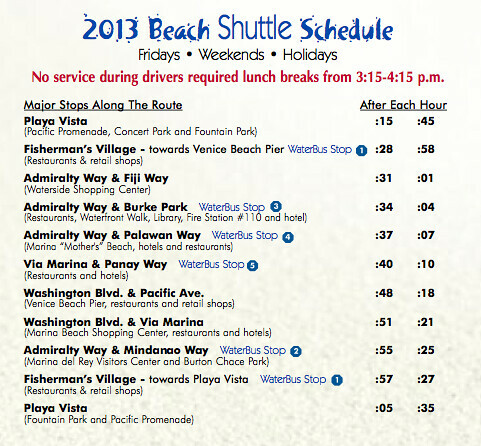 Free Beach Shuttle Between Venice and Marina + Playa Del Rey Returns! - Yo! Venice! Home Neighboring Communities Free Beach Shuttle Between Venice and Marina + Playa Del Rey Returns! Free Beach Shuttle Between Venice and Marina + Playa Del Rey Returns! The free summer shuttle service between the Venice Pier, Marina del Rey and Playa del Ray will resume service on May 24th this year. The service is available on weekends, holidays and for special events (including the Abbot Kinney Festival) through September 29th. Click here to download the full map and shuttle schedule. The beach shuttle provides service to major points of interest such as Fisherman’s Village, Waterside Shopping Center, Mother’s Beach and the Venice Beach Pier on Fridays and Saturdays from 10 a.m. to 10 p.m. and Sundays and holidays from 10 a.m. to 8 p.m. The beach shuttle also provides extended hour service (10pm) to the free summer concerts in Marina del Rey at Burton Chace Park.